Annual November Specimen Carp Classic. After the success of last year’s competition. An annual November competition is being held on the Specimen Lake here at White Springs on the weekend of the 5th to 7th November 2014. Entry fee for competitors is £100.00. £100.00 for a third place finish. Negotiations are ongoing with some major tackle manufactures for a biggest fish prize. After the Welsh Carp Masters this is Wales’s second biggest Carp Tournament. There are still five places remaining for this Classic Carp Match. Contact the fishery for further details as places are now limited for this premiere event held on premiere Carp Lake. 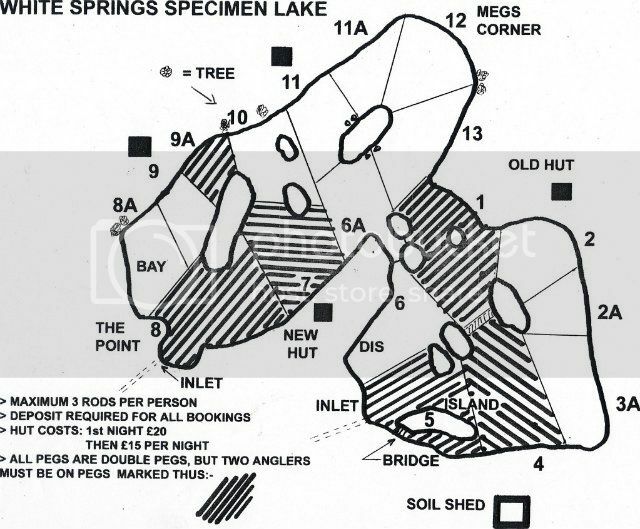 Have been asked a few times to show a plan of the new peg numbers on the Specimen Lake. Please take note of the swims that have too be occupied by two anglers. The black squares denote the cabins. Pirates 2009 Champion Geoff Walker receives his trophy from White Springs Owner Vince Lloyd. Geoff totalled 99 Points from the 42 matches, with Gordon coming in second with 78 points and Tony on 76points. We wish the match anglers all the best in 2010. Geoff Walker (69) was origonally from Stoke on Trent and he now lives in Talley, his personal best is 130lb which he managed to acheive whilst fishing the Match Lake here at White Springs itself. He likes to use the Pole and Paste as his favourite type of setup and he currently is using a Shimano Anteres 16M Pole with a Shimano Anteres Silk Shock Special Competition Line rated at 5.39lb and .140mm with a Kamason B981 Barbless Specimen Size 16 round bend hook. His Bait is expander pellets. He has fished for approximately 60 years and got hooked on fishing by accompanying his father all those years ago, being both a keen fisherman and cyclist he regulary (at least once a week) used to fish the Trent and Mersey canals. He told me that he just loves to fish and just loves the thrill of catching that fish, never knowing what is going to come out. He enjoys making his own end tackle and is very profficient at making floats from balsa wood and has been doing this since his early 20's. He leaned over and confided in me that sometimes he finds the making of the floats more satisfying than the fishing itself though he did admit that there is nothing better than catching a fish from one of his home made and very proffesional looking floats. Asking him what else he loves about fishing he told me that it was the social aspect of the fishing that he loved especially amongst the Pirates of which he is a founding member, amongst the Pirates he loves to wind them up and trade banter with them about the fishing and everything else. Geoff told me what he loved about White Springs........ there is a good variety of lakes here at White Springs so it is good to be able to have a change as it saves you getting bored. It is convienant for me to travel to as well. His most memorable experiance was one or two international matches where he got the chance to compete and win matches against some of the top anglers in the country, he nodded to me winked and pointed out one of the anglers opposite him, "Great guy he said and he fishes for Wales and I am in a competition with him what more can I say"
You shouldn't be afraid to ask the more experianced anglers on the lake for advice, you will learn more in an hour of watching an experianced angler that you will in 12 months fishing on your own, so dont be shy to ask and watch the experianced anglers. Sounds like good advice to me Geoff and with that we shall bid you good day and hopefully catch up with you another day. Good luck in your fishing in 2010 and congratulations on your results for 2009. A good days december winters fishing at White springs fishery. I can remember it well. I went on the old canal to fish for some perch. I started with a ledger rod down the edge to my right, I baited with red maggots,and fished a freshwater prawn on them,and did the same with the other rod,this rod was fishing to my left but with a float. This i fished over depth for lift bites. It wasn't long before the ledger rods tip started tapping three or four taps and around it went and i was into a nice perch around the 2lb mark,so i put it in the keepnet,within five minutes the float started to slide across and out away from the bank i struck and i was into another nice perch again around the 2lb + so again this one was in the keepnet. That was it for the float rod. I had TWO more good perch after that, they came on three dead,red maggots fished in the same spot. I decided to release the four perch as they had been in the keepnet for a while.So i needed some photos and a witness for one of the best days still-water perch fishing (excluding spinning for them on a nice river) i have ever had. total bag weight 8lb 3oz. Steven Huxter aged 23 from PenPedairheol was woken at 3.30 in the morning in the snow to find his lines in a frozen lake on the Soil Shed Swim and his alarm sounding, whilst playing the fish he was helped by his two mates Christian Duplessis and Tom James who broke ice in the lake to allow him to land this lovely Mirror that doubled his PB from 14lb to a lovely and very respectable 31lb2. Good luck Steven with your endeavours and we hope to see you down here again. On the 17th dec i went down springs for a 24hr session on a freebie as i had won the nov competition which i really enjoyed, two reasons for this was one not having to pay vince to fish, his face was a picture we all know how much he loves to have your money cheers vince ha ha. now about the fishing i was the only one fishing that night as the other two anglers that had been fishing were going home as i arrived. thats the thing i love the most about the winter is its always nice and quiet as all the summer anglers pack away their gear until next spring. having set up on the old cabin swim my favourite i had to wait until the following morning for my one and only run which was well worth the wait and the freezing conditions as it was my old mate the big common at a new p b weight of 33lb on the button, the fish is in tremendous condition like a bar of gold with its winter colouring. i've now caught this fish five times in the last two years it obviously likes my bait and having its photo taken with me ha ha. i dont understand how people dont fish down springs in the winter as i've always had my best results down there during this period, its definately the best winter water around this area. i know its hard fishing with the cold and the long dark nights but the rewards are there for those who percivere. merry christmas everyone and maybe see you down springs soon. cheers zoee. Tony Wale (70) is originally from Devon and is currently residing in Llandybie where he is heavily involved in various good works within the community and a man that likes to keep himself very busy. He enjoys in the fishing world a personal best of 240lb overall weight and his favourite method of fishing is down the edge. He enjoys fishing whilst using his trusty Garbolino G995 Pole and his powerline line with a B911 Kamason Size 8 Barbless Wide Gape Swept Point hook and likes to spend as much time as he can on the bank. "My favourite bait to use it sweetcorn. I like tesco's because it is cheap I don't think that the carp really cares which shop it comes from, they don't know if its from tesco's or its jolly green giant until it is in their mouth and then it is too late, they are hooked, I think it applys to most baits like sweetcorn"
You gotta admit he makes a good point! Asking him why he started fishing he told me without hesitation that is was due to ill health and he revealed that some time ago he had suffered three brain haemorages and had been told by Doctors that he had to lead a less energetic life in order not to futher damage his health and he had to take things a lot easier than he had for up until then Tony had lead a very energetic and atheletic career which included honary titles such as Captain of the British Orienteering team and he had ran against the top runners from the likes of Wales and Scotland for his home team in the top competitions several times quite sucessfully as well, he had also ran cross country for the 17 years when he was in the army which is no mean feat in its own right and something that only the top atheletes would be able to do for that length of time, you must admit some great acheivements in his lifetime and something to be proud of.
" Its the old hunting instincts, they never leave you, it's a sport that you will never stop learning and you will never beat it, thats why I love the challenge of it. "....loves the variety of fish at White Springs, the different challenges of the lakes and the fact that you can use your keepnet here when you are pleasure fishing, If you wanted to come here with your wife or friends and have a friendly little competition amongst yourseves fishing you can. Most fisherys will only allow you to use a keepnet in matches, here it is a relaxed atmosphere, they treat you like you are a responsible fisherman and you can fish here without having loads of rules being thrown at you, you are left to your own common sense, without the owner breathing down your neck and just left to enjoy your fishing in peace." "So what was your most memorable fishing experiance Tony?" I asked. "Catching my first 20lb'r at Broadwater, Godalming, It was my first 20lb Mirror Carp and I was relieved to get it into the net as I thought I was going to lose it, it fought me hard for about 15 minutes but I got it in the net relatively easy after that and my adrenalin was pumping, I used a rod and waggler at about 13-14 metres and it was some fantastic fishing." Have you got any advice to any up and coming anglers Tony? Read as much as you can about fishing, Learn as much as you can and listen to the other fishermen.....Don't believe all they say but keep an open mind, there is masses and masses of information out there and you got be able to sort it out and do things your way, make your mind up on what you are going to do and get out there and do it, that is what will give you the satisfaction in fishing, well it is for me. Well said Tony and White Springs wishes you all the best fishing in the world. His favourite setup is on his favourite pole which is a Shimano Exage Ax on which he uses a 012 Line with a 18 hook and a KC Carper Float 4g and Ringers Pellets and he is a match angler through and through. He told me he has fished since he was 17 and used to fish a lot with long time friend Colin Lockyer with whom he shared many great adventures. "The thing I love about fishing is the fish, I just love the fish, its the unknown factor with fishing, pitting your wits against the wily old fish and just being outdoors in all weathers, I love the challenge and also the banter with the boys in the matches, the friendly competative nature come win or lose its just good company with the boys fishing here." " Its everything here, the variety of fish here, with the different lakes and all the different silver fish here and also the specimen carp,"
He tells me that he has great respect for Mr Lloyd and loved the very friendly and relaxed fishing here at White Springs. What more can you ask for. Gordons most memorable fishing occasion came from a trip in Denmark where he was catching approximately 150lb of roach a day, he said it was out of this world, he has had bigger weights come in but that trip was something special. Fond memories. "You have to keep thinking, to make things happen. Keep things simple and use a variety of things and if it isnt happening then keep trying different things, you must have adaptability and versatility and confidence in what you are doing and the determination to suceed." Enjoy your fishing, go when you can and life is for living. Certainly is Gordon, certainly is, thank you for our chat and I hope that you suceed in your fishing and find the enjoyment that comes with it as so many do at White Springs. White Springs was very proud to be chosen this year as a host for the CarpAnd.Co.uk Social event which is now becoming a very popular event in the angling calander, with anglers from the up and coming fishing website coming from all over the country to try and covet one of the very sought after swims that form part of the social event. With the specimen lake being entirely prebooked by the organisers and closed to day ticket anglers from Thursday evening onwards for the social event, the lucky qualifying participants of the Carp and Co Event started to travel down on the Friday and meet up at White Springs with the other angling members of the site. Even though they may have talked to other members on the site for some time, for some this was the very first time they were actually meeting in person the other members of the site where fishing ideas are explored in depth and help is available to all up and coming anglers. The event is organised by CarpAnd.Co.uk administration who organise the events up and down the country and this one was organised by SparkyJon along with Dominic Walters. The idea is to pair up the anglers to each of the lakes swims, so that the anglers can come together in a social event, and share fishing tips, try out new things, swap tackle, help each other with their fishing, review fishing equipment and swap fishing storys of the one that got away! and if there is time in this busy schedule maybe even sneak a little fishing in as well. Well you gotta admit they are in the right place for it as these anglers (and with there being some very experianced names in the mix) fish different lakes all over the country and discuss them on the site and coming together like this allows them to be able to put a face to the name of the people that they talk to regulary across the internet. This year they chose White Springs as their winter venue for their social gathering and meet. Most anglers had arrived by late Friday afternoon and set up their bivvys ready for the main event which was being held on Saturday. This was to be a free BBQ held at the new cabin swim that was organised by the fishery owner of White Springs Vince. A marquee was arranged, with staff, food, soft drinks for the youngsters and a few beers for the lads being provided by Vince free of charge, Vince being Vince with his wicked sense of humour just had to put some duracell batteries for sale signs up to take the mick there was entertainment with a few of the guys playing the guitar and singing some golden oldies that was a huge sucess and even got Vince dancing! Arrangements had been made so that they guys could watch the Welsh rugby that was on television that afternoon as many of the lads were huge rugby fans after the BBQ finished. Where better to do that but in Wales. The result was a social event that was a huge success and enjoyed by all, and with the rugby being on as well what more can you ask for at a social event. With the lake being closed, the guys even though they had a busy social event and the rugby on and in fairness had to put up with some torrential rain that poured down over the weekend and suddden cold snaps, still had managed time to organise a mini fishing competition that in reality only consisted of a few hours of the rods being in the water mainly on the few hours available on the Friday after they arrived and a few hours on Sunday before they packed up. With the winner of the event being young up and coming angler Luke Mainwaring who scooped the pool prize just before it was due to close. With the extreme weather and the cold experianced at the event, it is a testiment to these anglers that in the very short time the rods were in the water at the infamous Specimen Lake here at White Springs, that any fish came out at all especially under these weather conditions but a few small lumps graced the banks. If you look at the impressive list of PB's of the anglers that attended the event (there will be a photo album of all the attending members by their rods taken on the sunday available shortly with their pbs in the photo details) you can see why it is a very much coveted social event to attend to, just for the wealth of knowledge within the angling industry that these anglers hold and why they managed to even in the short time they fished, managed to pull out a few small lumps here and there. Speaking to the organisers SparkyJon and Dom they told me that they had enjoyed their time here at White Springs and they would like to thank Vince and White Springs for the hospitality shown. With the organisers already planning the next event due to the huge sucess of this one, they have mentioned that they would like to possibly hold one of the events here again with a view of there being another one in April, with this one doing something that will help raise money for charity which is a worthy cause in anyones eyes. Events are organised all over the country to be fair to all their members who live futher afield. We wish the anglers all their sucess in their future endeavours and anyone wanting to attend the next events can contact the forum for more details. Being a relatively new comer to the angling world Lee (Alfy) Calford has only fished for about three years, yet has taken the sport by storm with a recent spate of high profile catches and a very successful year, here at White Springs. On catching up with Alfy I managed to grab a few words with the young sucessful angler and get his thoughts on fishing. "After arriving at White Springs I had no choice but too settle down on the Island swim due to the Speci Lake being pretty full, with the school being on half term. Around an hour after casting out one of my alarms broke into life! At first the fish came to the surface and came straight in but as soon as it caught sight of the net it was off again tearing away like a good un, A 15 minute battle with the monster ensued, until finally my mate managed to slip the net under this stunner of a fish known as "Billy the Bear". When we landed the fish it was a rush to see it as this is my first ever 30+ Mirror which came in at a stunning 34lb 6oz and a made it a new PB for me! Thank you Springs. "Never ignore the margins, keep it simple dont complicate things, my philosphy is to keep it simple and it will work nearly every time, in fairness, it has for me so far this year, and it has been a blinder of a year here at White Springs Fair play! Everyone is very good down there and you just gotta love the place, its great to meet the colourful charactors that come here and the social side of things are brilliant and the owner Vince is great. What more can you ask for? I dont get a lot of time to travel because of family and work commitments so its only White Springs I really fish at but what a place the fish here are just stunning and I love it here." Alfy finished his 24 hour session with a resounding 25lb 6oz mirror a 17lb mirror and a 13lb mirror and of course his 34lb 6 oz Billy the Bear making up a new personal best and finally getting his rod back to complete a fantastic 24hr session here at White Springs. With Alfy proving that the fish are back on the feed you know that it is the right time to come down and get that personal best yourself. If you see Alfy on the lake I know from personal experiance that he is a great bloke to talk to and will give you some really sound advice that will help you in your fishing. Well Done Alfy on your new Personal Best and what a lovely fish in the shape of Billy the Bear at a lovely 34lb 6oz. Dont forget the specimen lake is full this weekend 6-8th November 2009 with the Carpand.co.uk Social Fishing Get Together. We look forward to seeing The Crew down in force showing us how it is all done. Good luck to you all I shall look forward to meeting you all. Chris Andrews (15) and his friend Jack Lewis (15) both from Birchgrove, fished the Specimen Lake for the first time on a 24 hour session overnighter in the New Cabin Swim. With his Shimano Vengeance rods and Shimano Big Bait Runner Long Cast reels and using the CC Moore Live System Baits he pulled in a lively 15lb 10oz Mirror Carp on Monday night (shown above) and a lovely 16lb Mirror on Tuesday morning (shown below). His personal best is currently standing at 23lb 14oz Mirror and Chris loves White Springs for the big lakes and the big fish, his advice to up and coming anglers is to use the margins and above all to be patient. He says that too many people these days throw a line in and expect to catch and too many people of his age haven't got the patients, you gotta have the patients!. He enjoys fishing for the buzz of catching a fish and the atmosphere of fishing with the boys but above all he enjoys the peace and quiet that comes with fishing on such stunning lakes such as the Specimen Lake. Normally found on the Pit he decided to brave the big waters of the Specimen lake here at White Springs to go after the big fish that the lake is famous for and a good result for his first attempt at fishing the Infamous Specimen Lake. Well done Chris Andrews and we hope to see you back here more often. When I tracked down Alan Horton (58) he was actually for a change on the Specimen Lake going after the Silvers which is unusual for him so I am told as he is normally on the Canals. Today he was after one of the ultimate challenges, fishing for Silvers on the Speciman Lake. I say you are a brave man m8. "The same rod as a Hardy but a sight cheaper than the Hardy!" Alan enjoys fishing for Rudd, Roach, Tench and Bream with the Perch being his favourite fish. With a personal best of a 3 1/2lb Perch and 17lb carp both on the pole which I might add is no mean feat, especially as he explained he wasn't actually fishing for the carp and a combined weight of 188lb 8oz on the match lake he has in his fishing career taken to fishing like a duck takes to water. He started his fishing career about 10 years ago just after he retired and was looking for something to do to keep himself occupied when a friend of his suggested that he take up the sport. "now look at me, when i first started, I started off with a carrier bag and a mates rod and now I have got all the best kit and rods just like my mate and I spend as much time as I can". "It was that first fish, that feeling of excitement and adrenalin as it came to the surface, it was only a small one but it was that feeling that I got"
Asking Alan what his best bit of tackle was caused him to chortle and to hold up his quick pellet bander tool, I have to agree with him a marvelous bit of kit, I have one myself. Invaluable bit of kit for the serious matcher. He mentioned on a subject which I agree with about fishing and that too many people are forgetting the art of fishing and rely on too much technology to do the work for him, He jokingly said that if you dont have a float in your tackle box or you cant cast your rod out without using a bait boat then you can't really call yourself a fisherman, even though he was joking I personally think that there is a lot of truth in that statement and I also agree with Alan that the art of fishing is something that shouldnt be forgotton, we all should get the float out once in a while. During our conversation he remarked that he came to the Springs about 6 times a year to fish for the Perch on the old Canal especially in the winter so I asked him what kept him coming back to White Springs so often. "Its not only the fish" he said "its the people here, people are so friendly and ready to help you here at White Springs, especially Vince and Eileen, they are such nice people and if you have a problem in any way Vince isn't slow in sorting it out for you. Vince and Eileen are like having family friends they will do anything they can to make your stay more comfortable for you "
"Will always remember his cracking sense of humour and that he is missed but never forgotton. " I asked Alan what his most memorable fishing experiance was and he explained to me that he was down here earlier on in the year, in the spring and he had broken a section of his pole when he was fishing due to the wind being a bit high. "I can imagine you were devastated Alan" as I looked over his very good quality kit he had with him. Alan couldnt find a replacement section anywhere here locally so he must have thought that his planned fishing holiday would be ruined with not having his favourite pole. Well it turns out that there was a knight in shining armour in the shape of Vince, who had only gone and tracked down a replacement section and ordered it for Alan without him knowing, he even got the section expressed delivered for him from London, so that it was in the next day so he wouldnt miss out on fishing. Now seriously that is what you call service and going above and beyond the call of duty. As Alan explains this is just one of the many reason he loves White Springs and as he said "Vince is a star". The other reason of course is the fish and Alan was very happy here last Feb when he broke his personal best with Perch and landed a three and a half pound Perch from the Old Canal here at White Springs. "Just seeing that size of Perch and seeing the fin break the water it is the best feeling in the world, they are fin perfect here, absolutely gorgeous!!." and frankly I couldn't agree more with what he says and thats why White Springs Fishery attracts fishermen from all over the country who will come down especially for the Specimen Perch including big names like Matt Hayes. Alan we wish you all the best in the future it was a pleasure talking to you today and we hope to see you down here more often. Self Employed Plasterer/Builder Richard Sheppard (44) from Fforestfach, Swansea is a very sucessful plasterer/builder and has been for the last 24 years. He has been very sucessful in both his working and personal life and is considered a master tradesman, however like many of us he has known what it is like first hand to experiance the ups and downs that life can throw at you. Despite this Richard has always held his head up high and taken the rough with the smooth and it is this attitude towards life that has made him the man and the fisherman that he is today. This weekends session was no different as the fish we believe due to the sudden cold spell went quiet earlier in the week, and didnt start back up on the feed until the first day of the weekend. Thinking that he was going home empty handed, good fortune smiled on him this weekend and on the last day of his session he struck gold not once but twice with two fantastic catches, one 18 1/2lb in the morning and then romping in this fantastic 23lb14oz Mirror carp in the last few hours of his session this Sunday. Fate has a funny way of looking after those good people I believe and this weekend was a shining example of this on the famously difficult Specimen lake. Richard is no stranger to the quirks of the Specimen Lake as he has fished here at White Springs off and on for the last 15 years and has watched the site grow from strength to strength, he can remember when there was trout fishing here at the Springs and has seen some lovely fish come out in his time. A self taught fisherman who takes pride in everything he has done, he is one of those genuine fisherman that seems to grace our banks that has a real love for the sport and a real love and passion for the fish, and meeting and talking to him for the first time this weekend was a real pleasure. Richard has a personal best of 29lb 15oz Mirror which was caught roughly 3 months previous here at White Springs just missing out on the 30 Club by a whisker, he is determined however that he will achieve his goal of hitting that magical 30 and over and if anyone can do it I believe Richard is the type of man that will do it. He started fishing as many do with a mate of his and since that start has grown a love for fishing that has given him so much pleasure over the years. He told me that he loves the relaxation and pleasure that fishing can bring and the wonderful escape that only fishing can bring from the stresses of work and life. "I just love being outdoors Al, I have never been an indoor type of person I just love the countryside, love being outdoors and I love the sense of peace and tranquility that something like fishing can bring you." Using his Grey Prodigys with his Diawa Entoh 5000 spooled with 17lb Adrenaline with a inline running 2oz flat pear lead and a Korda kurv-shank size 8 he caught both fish today and also his PB previously using a 10ml Spicy Sausage Popup. Asking him which was his best bit of tackle he told me that it was his Delkin Alarms Tx1+ and asking him what advice he would give to up and coming fishermen he recommended that people should read as much as they can on fishing as this has helped him greatly over the years, his only regret was that he didnt read more on fishing earlier in his life. If anyone is looking for a real master craftsman in building and plastering and for a job to be well done they can contact Richard on 07875357012. We wish you all the best Richard and hope that you get that magical 30lb very soon. Fishing on the Island on the Specimen Lake today are some of the regulars which are affectionately known as The Crew. I met them when I visted them on the island to hear about their day at White Springs, present for the session was Alfy (29) from Llanelli, Johnathen Davies aka SparkyJon (31) from Cimla, and Jesse Collins (26) from Tumble whom I believe though dont quote me were down for a 48hr session celebrating Alfys Birthday on the Island. These fun loving, hard working, partying hard, crazy bunch of lads enjoy nothing better than to come to White springs to relax and to chill out and enjoy themselves as lads do. They say that it gives them a chance to unwind and to forget about the stresses of the working week and a chance to relax, have fun and wind each other up as was seen in the short time I was there with the boys constantly laughing and playing tricks on one another, Alfys favourite was triggering off the carp alarms when the others wern't looking to see them jump and you had to chuckle at his antics. Unfortunately Jesse was away when I first got there, so I met Alfy and SparkyJon first and they told me that within 15 minutes of Jesse leaving his alarms had gone off and they had bagged a nice 30lb for him, whilst we waited for him to return it seemed that they couldnt be serious for a moment and the atmosphere was full of laughter and jesting whilst they discussed White Springs, the fishing on the lake and told me a little about the specimen lake and the rigs that they use to fish it. I already knew how much of a difficult lake it was to fish for the beginner, yet the boys assured me that with some patients and the correct rig and bait I would be landing one on the lake and beating my personal best before I know it, they have promised to share some of their wealth of knowledge with us shortly via the site. Upon Jesses return I watched the fish being banked what impressed me was as soon as it had been landed the boys had the first aid kit out on the fish and checked it over for any signs of damage whilst Alfy started automatically applying some first aid to the mouth where the hook had been. When it came down to it though you could see how passionate they were about the fishing and the one thing that shone through was how serious they were on the subject of carp care, handling the fish correctly and having the right equipment there to deal with the larger fish that they specialise in was a very important subject for the boys and no more so for SparkyJon who is one of the staff at www.carpand.co.uk a free and easy going carp forum where no question is beneath being answered and where people have the freedom of speech to ask beginners questions as they please without moderation. They also from the forums organise Competitions on the Specimen Lake and there is one due in November (contact SparkyJon on forum for more details). He impressed upon me the need for the correct equipment and how some equipment being sold today wasnt correct or sutible for being used on lakes such as the specimen lake and frankly after seeing the size of the common carp they had landed it was easy to understand why they were so serious about it. At 30lb they were only 1lb short of the lake record for Common Carp. The fish was caught on Jess's rod and line using Destiny Baits Malarky but unfortunately for Jesse within 15 minutes of him leaving, his alarm started screaming with this 30lb beast and the fish was brought in by SparkyJon on Jesse's behalf. Jesse on his return remarked that it was just his luck to have the big one come in when he wasnt there. In fairness to the boys, even though I was in a rush that day, they very modestly declined to have the photo taken of the fish until Jesse returned as it was on his rod and when Jesse did return he modestly refused to have the photo taken as he hadnt landed it, so no-one wanted to take full credit for the catch so we opted to take a team photo and therefore we have included everyone in the picture. SparkyJon 21lb Mirror + approx 5 high doubles (unweighed). I have heard that since I left them they have caught approx 13 fish between them all in the high figures and I will try and get that confirmed and more details about them. All in all I was impressed by these boys knowledge of the lake and fish, their equipment and the rigs, for all their larking about they care passionately about the Fish and their wellbeing, White Springs and its future, and the people who visit there, and most impressively for me they were deadly serious about carp care which reminds me of the saying that "The carp are not ours but our childrens and our children's children", and it was their fun loving friendly, but highly respectful nature to the fish which made me respect these guys and I say credit where credit is due. Well done boys on your catch and well done on your acomplishments and attitude to the sport. You are a credit to fishing and I for one will look forward to hearing more of your adventures. Tight Lines. Ian Michael is a sucessful commerical businessman from CountryWide Gound Maintenance company which is a company that holds contracts with large companies such as the local authorities and welsh water and he regulary does work on some of the local castles including Neath Abbey monastary and Kidwelly castle. He says that he likes nothing better after a hard days slog to kick off his shoes and put his fishing gear on and to come down to White Springs with his lovely daughter Katie with whom he enjoys spending time with on the lakes. He says that of the fisheries he has tried White Springs is one of his firm favourites because of the convienace and the fish themselves. As an ex paratrooper and coracle fisherman Jeremy McKenny knows all about living out in harsh conditions and fishing in the worst of weathers, whilst the weather hasn't been too kind over the last week of fishing for him he has still managed to pull in a few twentys from the lake under what can only be described as severe storm conditions. A patient man who is happy to enjoy the time spent there going after his next personal best Jeremy has been fishing these waters for the last 12 years and still thoroughly enjoys the peace and quiet that White Springs offers him. Remarking on his years he says he has met some very memorable characters on the lake and loves the social part of the sessions as much as the pleasure that fishing brings to himself and his dog. Who incidentally was too shy to have their photo taken but instead gave me a quick bark or so whilst Jeremy put the kettle on and told me one or two storys of days gone by on the Specimen Lake. Good Luck Jeremy we hope that you can beat your Pb m8 and hopefully gain another entry in the Big Fish of White Springs Album to go alongside the 32lb 8oz Carp he had previously.